Security software and solutions vendor McAfee released its third quarter threat report on Wednesday, finding a significant increase in mobile malware and a new record for database breaches. Additionally, McAfee reported jumps in ransomware and signed binaries as well as password-stealing trojans and autorun malware. ● A financial fraud ring McAfee has dubbed Operation High Roller has gone worldwide, with cybercriminals using an automated transfer system to attack financial institutions. ● The number of unique samples of ransomware, which extorts money from its victims, grew by 43 per cent, making it one of the fastest-growing areas of cybercrime. Devices were infected via links in email and social networks, drive-by downloads, and pay-per-install methods. ● Malware growth slowed slightly but the overall number in the malware “zoo” still topped 100 million samples, as predicted. 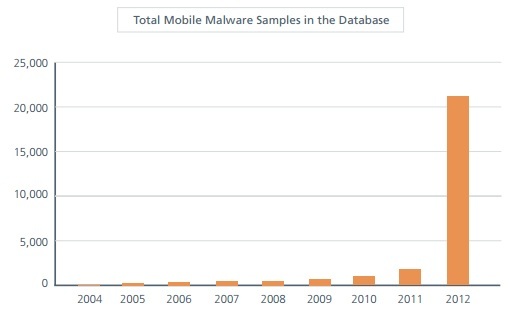 Mobile malware almost doubled the previous quarter’s total, while the Android platform remains the largest target. ● The total number of data breaches in 2012 has already surpassed the figure for the entire 2011 calendar year, with close to 100 new database-related vulnerabilities identified so far. ● Stealth malware, so named as its designed to avoid detection, continued its steady growth. ● Web and messaging threats were up with a 20 per cent increase in suspicious URLs, with more than half of them in North America.